I’m going to write this race report a little differently because I don’t want to focus as much on the actual race as much as what I’ve learned from doing the race and what I’m doing about it. Even though I’m not in ideal shape, I am excited and I have a plan. Also towards the end, I’ll mention some of the longer term challenges that affected both this race and Avilés—as well as what I’ve learned from going through this darker period. So let’s dig right in! I was a bit tired coming into Nationals. I was attending a work-related conference from Sunday to Wednesday and, while I was at the conference, I also spent my time managing work back home as well as helping out with a not-for-profit (which I’m a board member of) that was going through some serious troubles. All this created a bit more stress than I wanted to carry during race week. I was also still a bit tired from Worlds, which I returned from only the week before. On Thursday, I rode the course. My friend Rob Madgwick (a British ex-pat from TeamUSA who lives in Minnesota) and I went ahead of the group on the climb because we wanted to shake our legs out after flying. The bike course, which was a beautifully paved road up a long steady hill, wasn’t at all difficult. The downhill was unbelievably fun and I hit 45.4 mph on the descent. The run wasn’t so appealing—it was MUCH more hilly than the pre-race description. It seemed even more hilly when Rob and I ran the course the next day. On Thursday and Friday, I made it a point to head to Recharge Sports and take advantage of their recovery lounge. Recharge is an incredible facility that is centered around its state-of-the-art recovery tools. 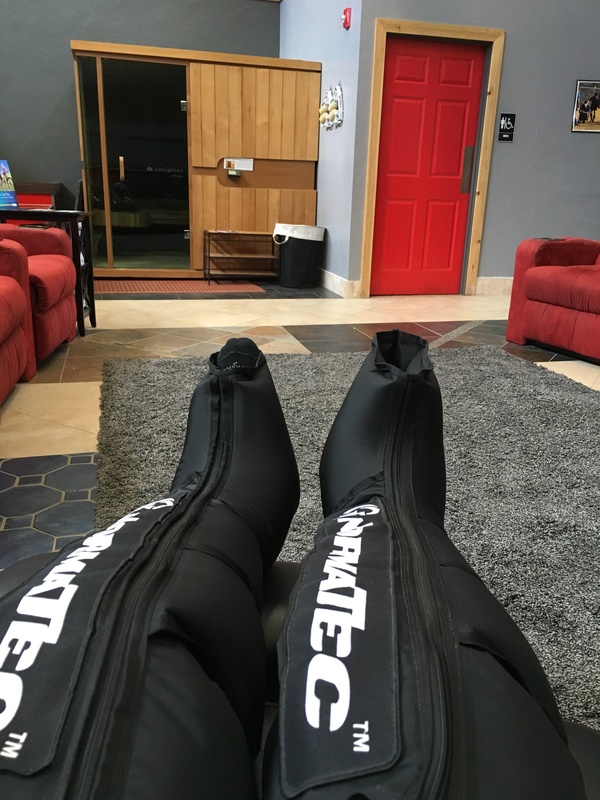 After using their Normatec compression boots, some hot/cold contrast therapy, and a session of Thai massage, my body was as good as it was going to get before the race. I MUST be in better shape than Avilés! This course was one big roller coaster with one big climb in the middle. We had to run the course twice for the first running leg and once for the second (it was a 5-K loop). And, of course, there was the altitude. But not having a back ache makes quite a difference as I ran this 10-K quite a bit faster than I ran in Avilés. Also, I was really struggling in Avilés but was largely “coasting” this run—I just let gravity carry me on the downhills while keeping my stride light and “worked” only on the uphills and the flats. Why wasn’t I working super-hard on this run? Well, my race fitness hasn’t been the best this year, as I discovered at both the Spring Classic Duathlon and Mount Rainier Duathlon. More importantly, however, my bike power was just terrible in Avilés—and I blamed that on running my opening 10-K far too hard. I also know from past races that running downhill fast is particularly hard on the legs and trashes any kind of power in the quads. Hence I was willing to push a little more on the flats and uphills but I was focused on keeping it easy on the downhills. This bike course was two loops of an out-and-back course up a long, steady, gentle climb up and then a fast descent. My power was low—just like in Avilés—and probably about 30 watts below my usual duathlon race power on a flat course. The roads were recently repaved and no technical at all. Going out on the first climb up the hill, I started feeling a little quiver in my upper right calf. I’ve had so many issues in that area that I didn’t recognize it for what it was—the early sypmtoms of a muscle cramp. 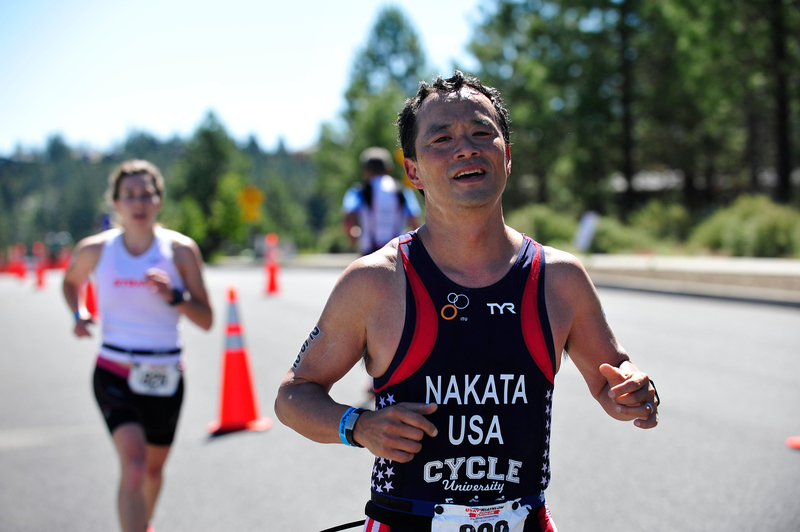 I NEVER get muscle cramps in my racing—usually because I take in a ton of electrolytes. About a minute later and my calf completely seize up to the point that I could not make a full revolution of my pedal stroke. So I had to stop on the middle of a climb and wait for the cramp to pass. Once my calf started cooperating again, I restarted my effort but obviously had to drop my effort level even further. Right after cramping, I could feel that the muscle tension was still there and I was convinced that it would come right back again if I pushed with any kind of serious effort. After the turnaround at the top of the hill, I knew I could make up ground on the downhill. A lot of triathletes don’t have much confidence descending but I’m relatively fearless. And I knew the course. Two days before on a practice ride of this course, I hit 45.4 mph going down this hill despite some nasty crosswinds that had me occasionally sitting up (my Garmin shows that I hit 43.3 mph during the race). I’m also more aerodynamic than most triathletes; one of my only God-given talents is being able to contort my body into a tiny shape and still pedal a bike. So on the descent, I was passing everyone! After the descent, I saw someone up ahead signaling for the turnaround—left lane goes around the cone for another lap up the mountain and right lane goes straight towards transition. But in other races, there are cones to mark it clearly—and the warning comes at least 50 yards up the road. Not this race. Consequently, I shot straight past the turnaround until I recognized that I wasn’t going the right way (probably about 3/8 of a mile). Then, I nonchalantly turned around and made my way back—losing all of the advantage that I earned from the screaming fast downhill. On the second climb of the hill, I had even less power than my first climb. Consciously or unconsciously, I think I was backing off on the (puny) power I was putting into the pedals because I feared that I would get a cramp again. But it never happened. And when I realized that I was having none of the symptoms of a second cramp, I started putting in a tiny bit more power. Normally, a hilly bike ride means a death march for a final run. But coming off the bike, my legs felt bad but not horrible. Sure, I was slow but I wasn’t suffering nearly as much as in other hilly duathlons. Of course, I knew that my time for this race was going to be really slow. As I was getting ready to leave transition, I could hear Tim Yount announcing that my friend Marcus Alexander was finishing the race (he took the national title—then again, he also holds one of Britain’s top five records at 3,000 meters). By now, the weather had warmed up quite a bit. As I was climbing the first little rise, my right adductor muscle started cramping. What the heck?!?! I so rarely get cramps and now I was getting two of them in one race. I feared that my calf would go next but it was fine. At one point, my adductor seized up pretty intensely and I almost started walking. But, I guess we don’t need our adductors nearly as much as we need our calves in duathlon as the cramp dissipated just by reducing my (already slow) pace for about a quarter-mile. I then started putting a little more effort into the run and, nearing the turnaround, I was passing a ton of people. I suspected that this would happen—while I wasn’t doing great, something told me that the folks around me were doing far worse. After all, they didn’t take it easy on the first run and probably weren’t forced to back on the bike. By contrast, even when I’m racing duathlons at the top of my game, my old coach’s warning, “it all comes down to the final run” echoes in my mind. While I was feeling fine, another little voice in my head kept reminding me about my adductor so I made sure not to run too hard. There was a long stretch down a walking path before the final turn into the finish area. Nearing the end of this stretch, I turned around and saw that there was a huge gap behind me. At this point, it’s a little hard to dig deep as it wouldn’t affect my standings at all. So I let up on the gas even more and coasted in to the finish. After the race, one of the guys I passed on the 5-K said that I was looking really strong and “super smooth” on the run—so he didn’t want to even try to match my pace. I’m happy with the compliment—particularly given how terrible I look during most runs. The picture at the right shows what I’m talking about. Normally, I look horrible when I’m running until I get to the finish line. Not this day. Overall, I finished in 22nd place in my age group. Because of the screwy way that that ITU determines eligibility for the World Championship, however, this was good for 25th place after application of the “aging up” rule. This puts me in the last available spot for “roll down” qualifications. If I qualify for Worlds (and qualification is far from clear), I likely won’t find out until just a few weeks before Worlds. What really stinks is that people in my age cohort (born around 1961 to 1969) are the largest group by far at Duathlon Nationals. I can be pretty confident about this because I’ve been racing Duathlon Nationals for some time now. When I was in the 45-49 age group, it was the largest age group and I couldn’t wait to “age up.” But, as soon as I did, my new age group was now the largest age group! I joked with my AG buddies afterwards that we’ll probably have the largest age group 30 years from now when we are all racing in the 80-84 year old age group! Unfortunately, this large cohort size has a real effect on qualifying for Worlds and makes qualification much harder for my cohorts than any other age group. For instance, my time of 2:39:43—while certainly not a fantastic race—would not place have placed lower than 15th position in any other age group. With the top 18 athletes in any age group getting an automatic slot (not a roll-down slot) for Worlds, I would have automatically qualified for Worlds if I was born at any other time than when I was born. Okay, enough about the race. It wasn’t a great race but it was about as good as my weakened body could sustain. I try not to dwell on the past. Each day is an experiment and I learned a lot from racing this year. So what have I learned? I mentioned that my body is frail right now because of injuries. In fact, all of the injuries I’ve been having are entirely my fault. Last summer, I mentioned that I had a frozen shoulder. Since I’m a duathlete, I don’t use my shoulders very much—and I failed to see my doctor until my shoulder condition affected my ability to ride on my aero bars. But my shoulder was bad enough to utterly destroy my ability to do planks and other strength and core work. And, when you’re over 50 years old, no strength work in the winter means lots of injuries in the spring and summer. The problem with committing to more strength work is that it just doesn’t happen. Runners and cyclists are notorious about dropping their strength work the instant that the weather turns nice. After all, would we rather be stuck inside lifting weights or would we prefer to be running or cycling in the sunshine? Right around the time that I flew out to Avilés, I signed up for Kinetic Revolution’s Bulletproof Runners Program. The idea is simple—you get a short program of a few targeted exercises each week (they rotate for different weaknesses and to add variety) that can be easily done at home in 15-20 minutes. James at Kinetic Revolution keeps you accountable via the program’s Facebook page. It cost about £16 a month, which is just about free post-Brexit (ouch, sorry…). If you find yourself short-changing yourself on your strength-training or just hate the gym, check out the Bulletproof Runner’s program. I’ve really been liking the program thus far. I think some of the exercises—particularly the core work—was critical to getting me to the finish line in Avilés. And I think it’s what made me a lot stronger and less fragile in the three weeks since then. In addition to the Bulletproof Runners program, I do have to undertake some focused work on my weak spots. This includes my right semitendinosis (a hamstring muscle that is at the heart of my pes anserine injury). Injuries obviously affect training… plus I think that my training may have been off to begin with. My combination of injuries affected all of my sports– I think I lost a solid month of both running and cycling plus interspersed missed workouts throughout the winter and early spring. These were key build periods for transitioning from base endurance to race-specific speed. But I also think that the training that I have been doing also has a bit off as it’s mostly been based on an early-season polarized training model. This means that my training log shows a ton of early season easy training miles. This may have also contributed to my injuries because I was stacking all those miles (up to about 50 miles a week) on an already unstable core. In chatting with the really strong athletes in my age division, most only run three run workouts a week. A lot of them are triathletes, so their other sports (swimming and cycling) easily gobble up the remaining days of the week. Some of them also mentioned that their bodies just couldn’t sustain five to six days of running each week without developing overuse injuries. They also mentioned that such a reduced running schedule meant that all of their runs had to be quality runs of relatively high intensity. If this sounds familiar to many runners, it should—this is basically the FIRST (Furman Institute of Running and Scientific Training) running program that was really popular a few years back. The idea is simple—you do only three running workouts (intervals, tempo runs, and long runs) at high intensity together with 2 days of moderate cross-training each week. Substitute key workouts in other sports for the 2 days of moderate cross-training and you’ve just described the pattern that my buddies have been following. Some of my friends made sure to mention that hill workouts and brick workouts are also key components at the right moments. I actually did these workouts during my week after Avilés (after my back recovered) and they were super tough! It’s the tempo workouts in particular that I have been missing as that workout just about killed me. Tempo runs in particular may require a little more build up—and probably adopting my “super-short recovery” strategy. After all, I am really weak in this area and tend towards the fast-twitch end of the spectrum. So instead of running three miles at a 7:02 pace, I could run 3 x 1 mile at 7:02 pace with only 5-10 seconds of recovery after each mile. As I suggested in my earlier post, the 5-10 seconds is insignificant physiologically but it makes all the difference mentally. “What about polarized training?” you may ask. I mentioned earlier that polarized training was working really well for me. But the FIRST program has a bunch of miles that are very close to lactate threshold. And that thought was exactly what was going through my mind as I was starting in on this workout plan. Because I lost such a key transitional period in my build of workouts due to injuries and didn’t get in the “tough miles” that I enjoyed with a polarized plan, it’s probably unfair to say that polarized training has stopped working for me. One thing is for certain, however: I need race-specific speed right now and my older training program isn’t getting me there. My cramps in my adductor and calf muscle was something new in this race—but it had a big impact on my (already compromised) race performance. As I don’t have a lot of experience with cramps, I can’t say that I have any proven solutions—but I do have some ideas. While I had terrible cramps, my friend Rob really suffered from them during his race. He asked me if I had ever heard of a product called HotShot. When I looked it up on my iPhone, I remember that I had heard about it. The idea is simple. Cramps have nothing to do with physical fitness—or even electrolytes. Instead, it has to do with over-excitement of the nervous system. It can happen to anyone during exercise. I had read elsewhere that researchers found by accident that stimulating a specific receptor in the back of the throat with mustard seed extract shunted this overexcitement almost instantly—and that HotShot was based on that finding. And because it’s a neurological response (as opposed to a chemical reaction that takes time to process through the body), the response was pretty much instantaneous. Given that I so rarely get cramps, I don’t think that I will use HotShot before workouts or races. Instead, I think it will be something that I will carry along “just in case” for any race longer than a 5-K. While the instructions don’t say that it’s required, I would probably stop, gulp the bottle in my mouth, and, of course, make sure to coat the back of my throat. And, of course, I’ll have to try it in training first. So TeamUSA and the World Championship is at risk this year because my parents chose the wrong year to have a second child. Plus, I wasn’t really fit enough to run this race well. In most years, being anywhere on the roll-down list pretty much guaranteed a Worlds spot… eventually. But with the World Championship in Canada, a lot more people will likely sign up to go. On the other hand, Penticton, British Columbia (where the World Championship will be held) isn’t the easiest place to get to because it requires an international flight and then a fairly long drive. But all hope is not lost. USAT has another qualifier race in New Orleans in November! This is because the sprint duathlon at Nationals this year (and last year) was a no-drafting race. This is VERY different from the World Championship, which is a draft-legal race. 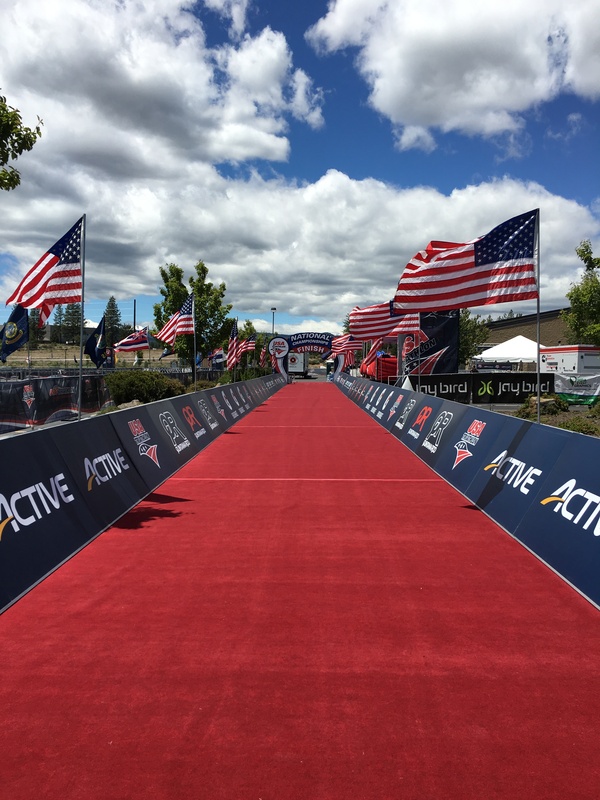 To make it more fair, USAT gives eight spots out at the National Championship and ten more spots at a separate draft-legal “qualifier” race later in the year.